75 Years Ago, 'War Of The Worlds' Started A Panic. Or Did It? : The Two-Way On the evening of Oct. 30, 1938, Orson Welles and his troupe went on the air to say that Martians had invaded New Jersey. Ever since, stories have made it sound as if the broadcast caused a mass panic. But that might not have been the case. Invader? No, it's a man dressed as one in 1988. 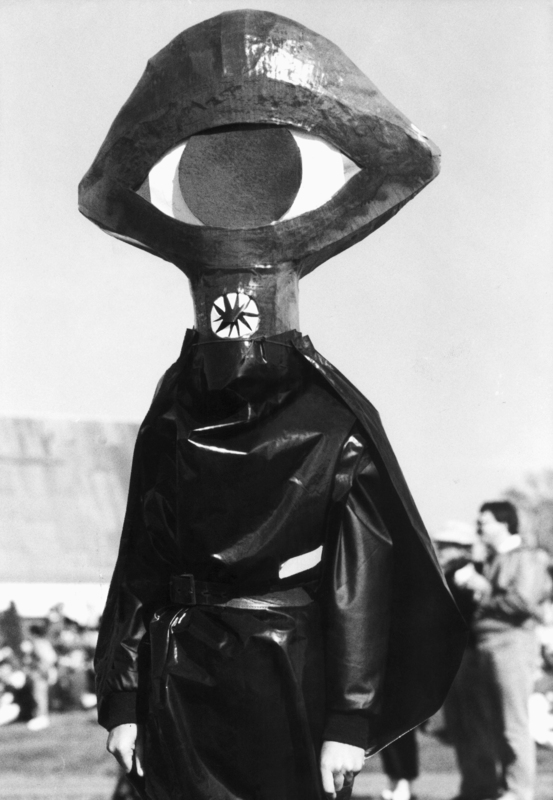 He was in Grovers Mill, N.J., at a 50th anniversary celebration of The War of the Worlds broadcast. Martians have invaded New Jersey! OK, as far as we know that hasn't happened. 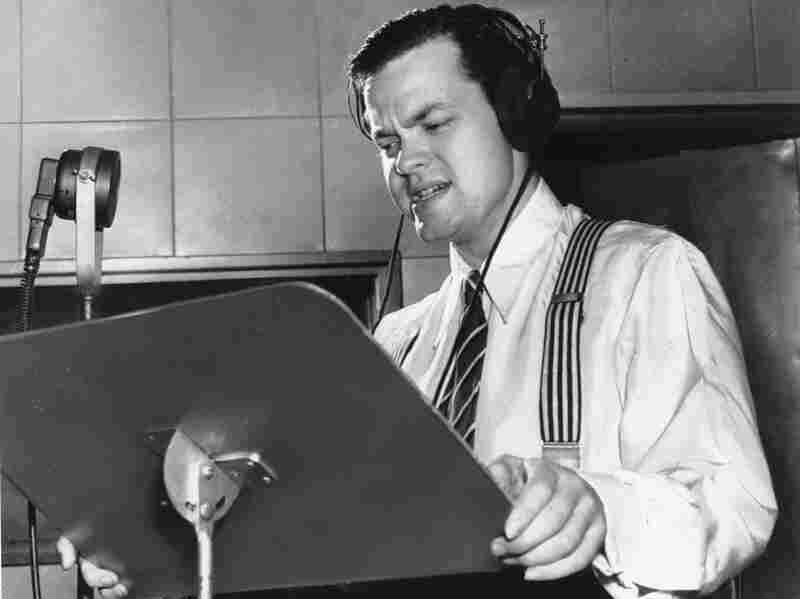 But we wanted to issue that faux alert because 75 years ago tonight, as our friend Korva Coleman pointed out on the NPR Newscast, Orson Welles and his troupe of radio actors interrupted the Columbia Broadcasting System's programming to "report" that our planet had been invaded. Ever since then, it's been accepted as fact that the broadcast scared the dickens out of many Americans. Morning Edition, for instance, reported in 2005 that "listeners panicked, thinking the story was real." Many supposedly jumped in their cars to flee the area of the "invasion." Just this past weekend, our colleagues at Radiolab devoted their very first live hour to a "deep dive into one of the most controversial moments in broadcasting history: Orson Welles' 1938 radio play about Martians invading New Jersey." According to Radiolab, about 12 million people were listening when Welles' broadcast came on the air and "about 1 in every 12 ... thought it was true and ... some percentage of that 1 million people ran out of their homes." "That constitutes a major freakout," Radiolab says. Orson Welles delivering a radio broadcast in 1938, the same year he aired his War of the Worlds fake news program. "Far fewer people heard the broadcast — and fewer still panicked — than most people believe today. How do we know? The night the program aired, the C.E. Hooper ratings service telephoned 5,000 households for its national ratings survey. 'To what program are you listening?' the service asked respondents. Only 2 percent answered a radio 'play' or 'the Orson Welles program,' or something similar indicating CBS. None said a 'news broadcast,' according to a summary published in Broadcasting. In other words, 98 percent of those surveyed were listening to something else, or nothing at all, on Oct. 30, 1938. This miniscule rating is not surprising. Welles' program was scheduled against one of the most popular national programs at the time — ventriloquist Edgar Bergen's Chase and Sanborn Hour, a comedy-variety show." Slate also argues that there's no data to support the idea that many radio listeners heard about the broadcast and tuned in during it. And it points out that "several important CBS affiliates (including Boston's WEEI) pre-empted Welles' broadcast in favor of local commercial programming, further shrinking its audience." So how did the story of the "panic" grow over the years? Slate blames newspapers, which allegedly "seized the opportunity presented by Welles' program to discredit radio as a source of news. The newspaper industry sensationalized the panic to prove to advertisers, and regulators, that radio management was irresponsible and not to be trusted." Radiolab isn't the only news outlet marking the 75th anniversary, of course. There's also this report from PBS-TV's American Experience, which says that "although most listeners understood that the program was a radio drama, the next day's headlines reported that thousands of others plunged into panic, convinced that America was under a deadly Martian attack." From the Web: A transcript of The War of the Worlds broadcast. So which was it, mass panic or hyped-up hysteria? Something in between? This blogger recalls his father saying the broadcast went mostly unnoticed in the quiet hills of Western New York State. Any other first- or second-hand memories are welcome in the comments thread.